Homo sapiens is above everything else a social animal. Not just in the sense that humans care about each other. We also orientate, evaluate and compare ourselves in the context of other people. In order to do this however, we first need to understand what other people are doing and social comparison always presupposes one or more dimensions of meaning. To understand other people’s behavior we oscillate between observing their behavior and reconstructing their beliefs and intentions. When possible, we use our language to inquire and obtain information that may be hard to get to otherwise. This oscillation is at the center of a process where we form hypotheses and fit the pieces together until we are ready to settle for one of these as the most likely explanation for the behavior we have observed. 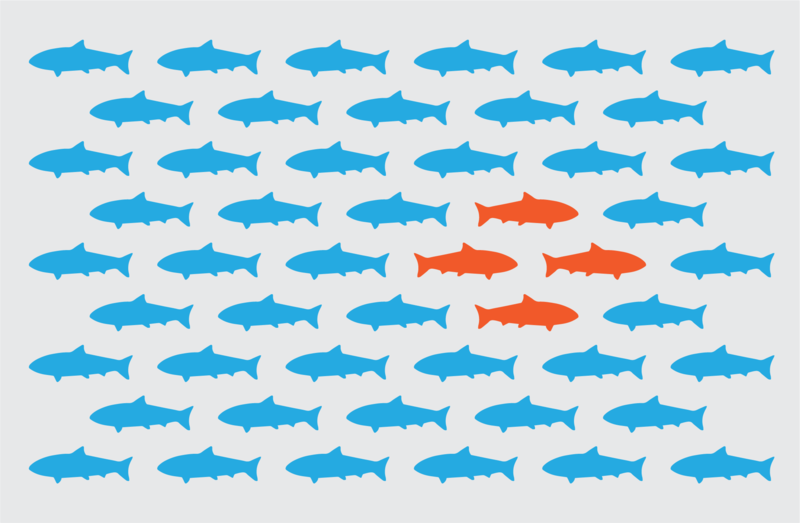 When it comes to complex behaviors this process is full of potential biases. We tend to stick to our initial hypotheses by mainly searching for information that confirms these; we systematically underestimate the influence of context and favor more personalized explanations; we tend to disregard that conversation often introduce more noise than useful information; and quickly forget that it was the most likely and not necessarily the final explanation we settled upon. But for more simple behaviors like fetching something in the fridge we perform quite well without giving it much thought. Taking cues from other people’s behavior is a valuable resource when we seek to improve our own decision-making. In fact, the value of this process is so advantageous that nature has provided us with a hard-wired tendency to imitate others. Not surprisingly descriptive norms may be used by choice architects to improve decision-making, and given our social nature this is a highly efficient tool in the nudge-box. By simple elicitation of descriptive norms the choice architect may highlight information or reframe situations. In fact, the choice architect may even use the elicitation of descriptive norms to change the incentives of a particular context. Naturally, this may be done for better or for worse – and sometimes for both at the same time. In 2011 the Behavioural Insights Team, popularly referred to as the UK “nudge-unit”, ran a series of trials involving patients and their doctor appointments. The trials had as their goal to minimize no shows for doctor appointments. They did this by making the patients actively commit to attend appointments and coupled this with social information, showing the patients just how many other people usually turned up for their appointment. While active commitment itself helped reduce no-shows by 18%, coupling this with the descriptive norm that “y out of x show up at their appointment” almost doubled the effect reducing the rate of no-shows to 33%. Eliciting descriptive norms may also be used to lower household electricity consumption. However, when the elicitation of such information plugs in to our conscious decision-making this means that variations in the frame of values held by subjects will be mirrored in the effect. A 2010 US study by economists Dora Costa and Matthew Kahn examined data from a field experiment involving 35,000 randomly selected households in California. The experiment was designed to understand how households would respond to feedback about their energy usage compared to that of their neighbors. However, the researchers also combined information on voter registration, allowing them to explore in detail how conservative and liberal households responded to the same nudge. The study found that the nudge had the intended effect of lowering energy consumption among liberals, but a slighty opposite effect on some conservatives. They found that social comparison led to a 3.1% decrease in electricity consumption for registered liberals, but a small increase in consumption among more conservative households. These findings underscore the importance of calibrating nudges correctly relative to different cultural contexts, and it´s entirely possible that Kahn and Costa would have seen different or opposite effects from voter´s political orientation outside the US. Another interesting study is a 2011 UK-based study by Paul Dolan of the London School of Economics and Robert Metcalfe of the University of Oxford. They tested how the impact of descriptive norms, with and without information on energy-saving behavior affected gas usage. The field experiment was based on 569 homes owned by Camden Council. Households were randomly split into three groups. One was selected to receive a basic energy statement as usual (this was the control group); one to receive additional information about the average consumption of similar sized homes in the neighborhood (the descriptive norms treatment); and one to receive further information demonstrating how to change energy use (the descriptive norm plus information treatment). *(Note: in these studies the norms elicited are referred to as social norms, but are actually descriptive). The study found that households provided with both the norm and the information reduced consumption by 9%, an effect almost twice as big as when they were given the descriptive norm alone. The reduction in energy usage was also longer lasting among those households that received a combination of norms and information. Read more. Last year we directed a pilot experiment aimed at getting people to turn their lights off after leaving the office. The experiment combined elicitation of a descriptive norm (“85% of Students remember to turn the lights off”) with a salient sticker placed next to the light switches (see figure below). Figure 2. 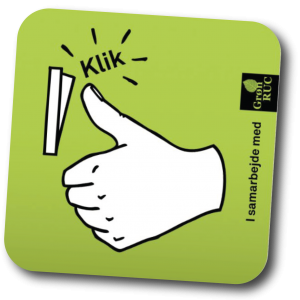 The salient sticker used in the experiment. Although the experiment was mainly designed to test measurement design and strategies, it still indicated a reduction of about 20-26% in lights on after working hours. Like the Dolan and Metcalfe study this shows how descriptive norms may be combined with nudges as well as information with increased effect. Since something as mild as descriptive norms can lead to behavior change, it’s not surprising that the elicitation of descriptive norms – whether real or concocted – is a very attractive tool in the nudge-box. However, one should remember to be cautious when applying this. Most of us can probably recall several advertisements trying to leverage profit from announcements along the lines of: “9 out of 10 people prefer our product”. In the long run this strategy may easily come to weaken the use of descriptive norms for good purposes by undermining the credibility of eliciting descriptive norms as well as their useability in the pursuit of behavior change. Thus, Copenhagen recently saw a campaign announcement stating that: “83% of the citizens in Copenhagen regularly pick up litter after others”. This obviously seems a case of bending the truth. While most people may remember a situation or two where they did this, it hardly seems credible as a descriptive norm of everyday behavior. In conclusion, we advice only honest and relevant use of descriptive norms in choice architecture. Descriptive norms enjoy close relations to social norms, i.e. norms relying on mutual expectations, evaluation and sanctions. As David Hume pointed out nearly three hundred years ago in his A Treatise of Human Nature(1740), such norms easily grow or come to connect with normative expectations and post-hoc rationalizations. As a result of this, we often come to infer from “what is” to what “one ought to” (the naturalistic fallacy). This means that public elicitation of descriptive norms may indirectly harness the power of social norms – but at the cost of bundling behavior in with social expectations, evaluations and sometimes even sanctions. This can be done delicately like we saw last year, when the Danish communication bureau Operate launched a campaign aimed at closing the gap between what young people in Denmark believe about the financial behavior of their peers and what this behavior really is. Here young Danes believed that other young Danes were much more likely to take up credit than they actually were. Inspired by social norm programs in the UK and US, the campaign was aimed at eliminating the mental apology used by young consumers when taking up expensive credit loans and to the establishment of a mental cue promoting the idea that one really “ought” not take such a loan or risk receiving a negative social evaluation from peers. While highly attractive, making descriptive norms public or indicating their existence may also be done in ways that are ill conceived and without care for the people maneuvering in the decision-making context that the choice architect is responsible for. Thus, in a talk I gave last year for the Danish Designers I used an imaginary example of nudging people to favor the stairs over the escalator to illustrate the dangers of even indicating descriptive norms in the public – a “nudge” I never thought anyone would be so careless as to implement. Yet, reality often exceeds expectations and we’ve recently observed the following picture going viral on the Internet. Figure 3. 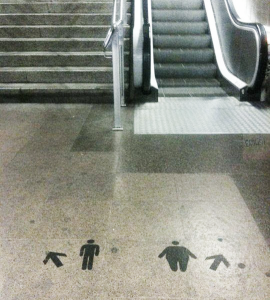 A nudge reported to be from Spain. Given what we’ve pointed out about descriptive norms above, you don’t need a Ph.d. to realize why some people may feel stigmatized in front of everyone else in a public space that belongs to them as much as it belongs to the choice architects. Still, descriptive norms may be of good use in many other instances than those mentioned here. We would like you to share your example in the comments. By courtesy of Meltzoff, A. N., & Moore, M. K. (1977). 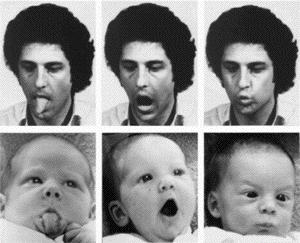 Imitation of facial and manual gestures by human neonates. Science, 198(4312), 75-78.